Walter Everett Darling was born September 21, 1883, in Aldine Twp., Norton Co., KS, and died May 17, 1964, at his home, Gooding, Gooding Co., ID, at age 80. Buried in Elmwood Cemetery, Gooding, Gooding Co., ID. He is the son of Orville Montlabon "Mount" Darling of Vermont Twp., Fulton Co., IL, and Louisa "Louise" Wileman of Vermont Twp., Fulton Co., IL. Elda Elora "Eldie" Krause was born May 21, 1883, in Aldine Twp., Norton Co., KS, and died March 28, 1969, at Magic Valley Memorial Hospital, Twin Falls, Twin Falls Co., ID, at age 85. Buried in Elmwood Cemetery, Gooding Co., ID. She is the daughter of August Ferdinand Krause of Swanbach, Prussia, Germany, and Mary Jane Abbey of Clarke Twp., Durham Co., Ontario, Canada. Walter Everett Darling and Elda Elora "Eldie" Krause were married February 26, 1907, in Aldine Twp., Norton Co., KS. Lois Mae Darling: Born December 16, 1907, in Norton Twp., Norton Co., KS; Died September 11, 1984, in Twin Falls, Twin Falls Co., ID (age 76). Buried in Sunset Hills Memorial Park Cemetery, Twin Falls, Twin Falls Co., ID. Married September 21, 1927, in Gooding, Gooding Co., ID, to Albert William Lulloff: Born June 26, 1906, in Seattle, King Co., WA; Died June 27, 1988, in Lucerne, Lake Co., CA (age 82). Buried in Sunset Hills Memorial Park Cemetery, Twin Falls, Twin Falls Co., ID. Mary Augusta Darling: Born June 18, 1910, in Gooding Precinct, Gooding Co., ID; Died May 2, 2001, at Hillcrest Care Center, Boise, Ada Co., ID (age 90). Married December 31, 1933, in Gooding Precinct, Gooding Co., ID, to George William Cleveland: Born September 25, 1908, in Kimball, Alberta, Canada; Died March 9, 1989, at his home, Boise, Ada Co., ID (age 80). Nile Everett Darling: Born September 11, 1912, in Gooding Precinct, Gooding Co., ID; Died due to suicide, February 11, 1959, at his home, 4451 Redding St., Oakland, Alameda Co., CA (age 46). Buried in Golden Gate National Cemetery, San Bruno, San Mateo Co., CA. Married (1) July 22, 1933, in Gooding Precinct, Gooding Co., ID, to Thelma B. Harris: Born January 19, 1901, in California; Died February 14, 1971, in San Francisco, San Francisco Co., CA (age 70). Divorced. Married (2) 1946 - 1956 in Unknown, to Elizabeth Caroline "Bessie" (Scarper) (Beaulieu) Loder: Born May 27, 1897, in Pueblo, CO; Died October 15, 1995, in Sparks, Washoe Co., NV (age 98). Mable J. Darling: Born October 11, 1915, in Gooding Precinct, Gooding Co., ID; Died August 9, 1985, in Yellowstone Co., MT (age 69). Married about September 27, 1936, in Idaho, to Truman Edmond Mason: Born August 5, 1906, in Shoshone, Lincoln Co., ID; Died October 11, 1994, in Hardin, Big Horn Co., MT (age 88). Myrtle Jean Darling: Born October 11, 1915, in Gooding Precinct, Gooding Co., ID; Died September 11, 2006, at Billings Clinic, Billings, Yellowstone Co., MT (age 90). Buried in Mountainview Cemetery, Billings, Yellowstone Co., MT. Married July 3, 1935, in Boise, Ada Co., ID, to Garth Crawford Hougaard: Born February 24, 1913, in Manti, Sanpete Co., UT; Died September 21, 1990, in Yellowstone Co., MT (age 77). Buried in Mountainview Cemetery, Billings, Yellowstone Co., MT. 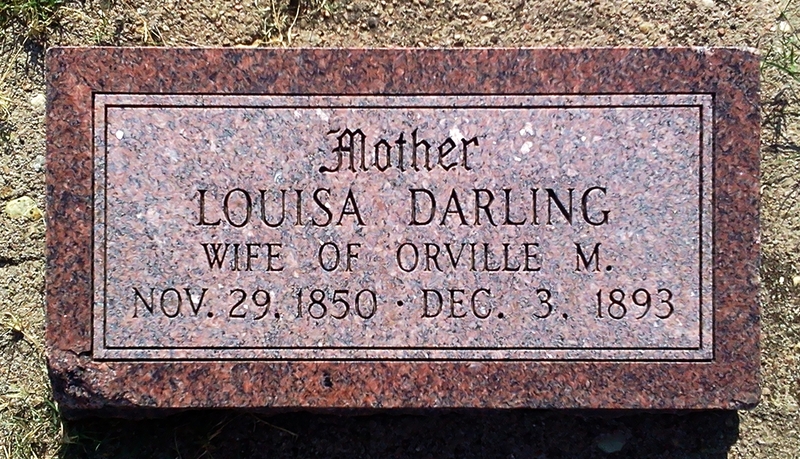 Louisa "Louise" (Wileman) Darling is buried in Norton Cemetery, Norton, Norton Co., KS. Thanks to Find-A-Grave for making this image available. Orville Montlabon "Mount" Darling is buried in Elmwood Cemetery, Gooding, Gooding Co., ID. Thanks to Find-A-Grave for making this image available. Walter Everett Darling and Elda Elora "Eldie" (Krause) Darling are buried in Elmwood Cemetery, Gooding, Gooding Co., ID. Thanks to Find-A-Grave for making this image available. 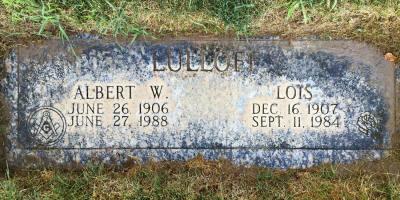 Albert William Lulloff and Lois Mae (Darling) Lulloff are buried in Elmwood Cemetery, Gooding, Gooding Co., ID. Thanks to Find-A-Grave for making this image available. 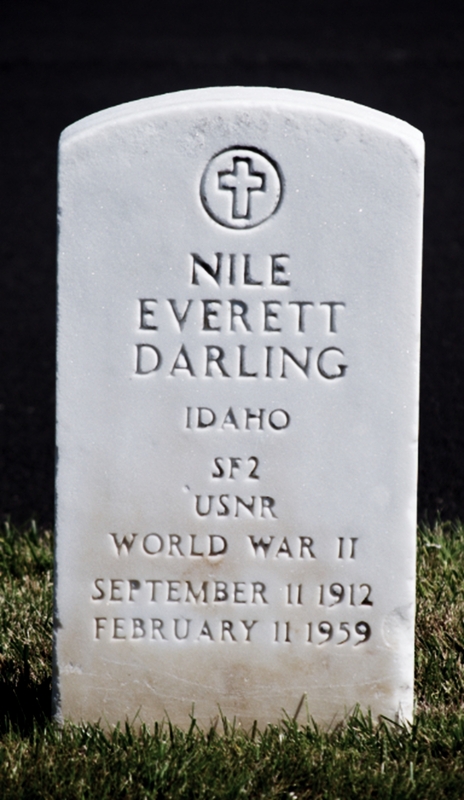 Nile Everett Darling is buried in Golden Gate National Cemetery, San Bruno, San Mateo Co., CA. Thanks to Find-A-Grave for making this image available. 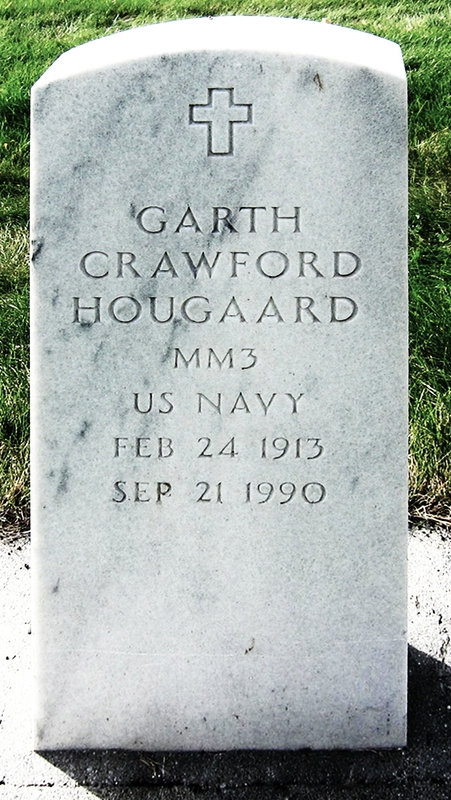 Garth Crawford Hougaard and Myrtle Jean (Darling) Hougaard are buried in Mountainview Cemetery, Billings, Yellowstone Co., MT. Thanks to Find-A-Grave for making these images available. 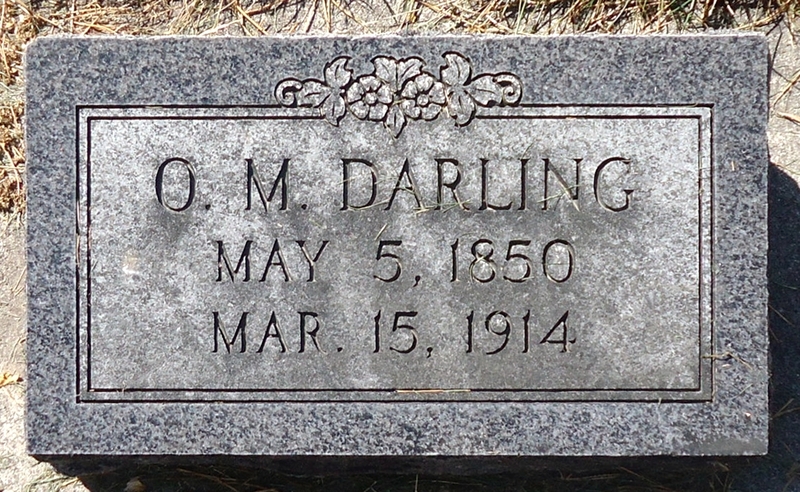 Orville Montlabon "Mount" Darling was born May 5, 1850, in Vermont Twp., Fulton Co., IL. Louisa Wileman was born November 29, 1850, in Vermont Twp., Fulton Co., IL. Orville Montlabon "Mount" Darling and Louisa Wileman were married January 1, 1871, in McDonough Co., IL. Orville Montlabon "Mount" Darling and Louisa "Louise" Wileman, possibly their wedding picture. 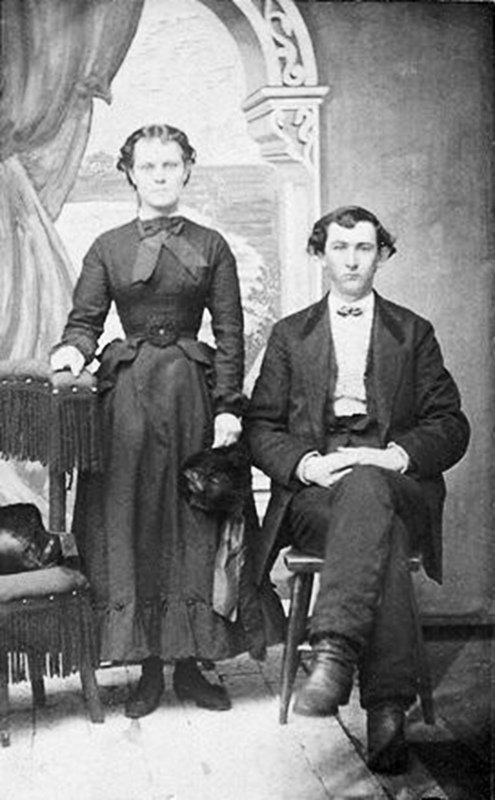 August Ferdinand Krause and Mary Jane Abbey were married March 2, 1880, in Fond du Lac Co., WI. The 1880 U. S. Census taken on June 23, 1880, shows August Crouse (age 24) born in Germany to German-born parents is a Farmer and is living in Aldine Twp., Norton Co., KS. Living with him is his wife, Mary J. Crouse (age 20) born in Canada to Canadian and English-born parents, who is Keeping House. Leigh Larson note: Mary J. (Abbey) Krause, and his sister, William S. Abbey, are living on adjacent farms. The 1880 U. S. Census taken on June 23, 1880, shows William Abbey (age 27) born in Canada to Canadian and English-born parents is a Farmer and is living in Aldine Twp., Norton Co., KS. Living with him are: his wife, Ida Abbey (age 21) born in Wisconsin to Pennsylvania-born parents, who is Keeping House; his son, Irwin Abbey (age 4) born in Wisconsin to Canadian and Wisconsin-born parents, with a disability named Billious Fever; and his daughter, Ivey Abbey (age 2) born in Kansas to Canadian and Wisconsin-born parents. The 1880 U. S. Census taken on June 25, 1880, shows Orville Darling (age 30) born in Illinois to Delaware and Virginia-born parents is a Farmer and is living in Aldine Twp., Norton Co., KS. 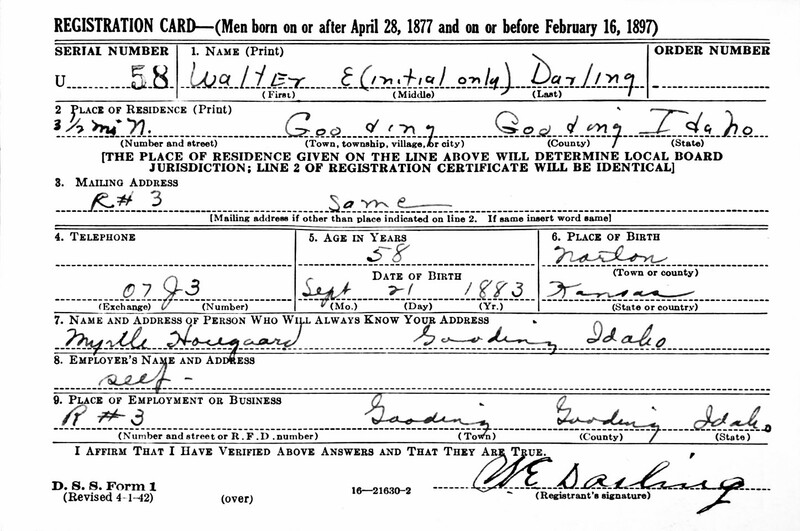 Living with him are: his wife, Louisa Darling (age 29) born in Illinois to Ohio-born parents, who is Keeping House; his son, Emmer Darling (age 8) born in Illinois to Illinois-born parents; his daughter, Effie Darling (age 5) born in Iowa to Illinois-born parents; his daughter, Ida Darling (age 3) born in Nebraska to Illinois-born parents; and his son, Ray Darling (age 1) born in Kansas to Illinois-born parents. The 1880 U. S. Census taken on June 3, 1880, shows Margaret Wileman (age 54) born in Ohio to Pennsylvania-born parents is a widowed head of household with Rheumatis who is Keeping House and is living in Vermont Twp., Fulton Co., IL. Living with her are her two unmarried daughters: Mary Wileman (age 19) born in Illinois to Virginia and Ohio-born parents; and Emma Wileman (age 18) born in Illinois to Virginia-born parents. Elda Elora "Eldie" Krause was born May 21, 1883, in Aldine Twp., Norton Co., KS. Walter Everett Darling was born September 21, 1883, in Aldine Twp., Norton Co., KS. The 1885 Kansas State Census dated March 1, 1885 shows O. M. Darling (age 35) born in Illinois and moving from Nebraska is a married Farmer living in Aldine Twp., Norton Co., KS. Living with him is a married female, Louisa Darling (age 35) born in Illinois and moving from Nebraska. Also living there are six children: Emmer Darling (age 13) born in Illinois and moving from Nebraska; Effie Darling (age 10) born in Iowa and moving from Nebraska; Ida Darling (age 9) born in Nebraska and living there 1 year and moving from Nebraska; Ray Darling (age 6) born in Kansas and moving to Kansas 3 years ago; Clarance Darling (age 4) born in Kansas; and Walter Darling (age 1) born in Kansas. Orville had no military service. The 1885 Kansas State Census taken on March 1, 1885 shows A. F. Krouse (age 29) born in Germany and having moved from Wisconsin is a married Farmer living in Aldine Twp., Norton Co., KS. Living with him are: a married female, M. J. Krouse (age 25) born in Canada and lived there 1 year and having moved from Wisconsin; Effie L. Krouse (age 3) born in Kansas; and Elda E. Krouse (age 1) born in Kansas. 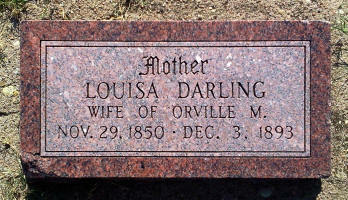 Louisa "Louise" (Wileman) Darling died December 3, 1893, in Aldine Twp., Norton Co., KS. Buried in Norton Cemetery, Norton, Norton Co., KS. The 1895 Kansas State Census dated March 1, 1895 shows O. M. Darling (age 44) born in Illinois and living there 2 years and moving from Nebraska is a Farmer living in Aldine Twp., Norton Co., KS. Living with him are 10 Darlings: Emery Darling (age 23) born in Illinois and moving from Nebraska; Effie Darling (age 20) born in Iowa and after 1 year moving from Nebraska; Ida Darling (age 18) born in Nebraska and moving from Nebraska; Wray Darling (age 16) born in Kansas; Clarance Darling (age 13) born in Kansas; Walter Darling (age 11) born in Kansas; Harvey Darling (age 9) born in Kansas; Ernest Darling (age 5) born in Kansas; Laura Darling (age 3) born in Kansas; and Florence Darling (age 2) born in Kansas. Orville had no military service. The 1895 Kansas State Census taken on March 1, 1895 shows August Krause (age 49) born in Germany and lived there 1 year and having moved from Wisconsin after living there 2 years is a Farmer living in Aldine Twp., Norton Co., KS. Living with him are: Mary J. Krouse (age 35) born in Canada and lived there 1 year and having moved from Wisconsin; Effie Krause (age 14) born in Norton Co., KS; Elda Krause (age 11) born in Norton Co., KS; Belle Krause (age 9) born in Norton Co., KS; Oscar Krause (age 6) born in Norton Co., KS; Alfred Krause (age 4) born in Norton Co., KS; Wallace Krause (age 2) born in Norton Co., KS; and Ralph Krause (age 1) born in Norton Co., KS. The 1900 U. S. Census taken on June 20, 1900, shows August F. Krause (age 44) born November 1855 in Germany to German-born parents and having emigrated in 1861 and not Naturalized is a Farmer owing his farm free of a mortgage and is living in Aldine Twp., Norton Co., KS. Living with him is his wife of 20 years, Mary J. Krause (age 40) born July 1859 in English Canada to English Canadian and English-born parents and having emigrated in 1860 with Unknown Naturalization, with 9 of the 11 children born to her still alive. Also living there are his children, all born in Kansas except for Alfred, who was born in Wisconsin: Effie L. Krause (age 19) born March 1881, shown as married less than one year; Elda E. Krause (age 17) born May 1883; Belle E. Krause (age 14) born November 1885; Oscar O. Krause (age 11) born November 1888; Alfred O. Krause (age 9) born October 1890; Wallace A. Krause (age 7) born September 1892; Jason R. Krause (age 6) born March 1894; Nellie A. Krause (age 4) born February 1896; and Minnie L. Krause (age 2) born May 1898. The 1900 U. S. Census taken on June 18, 1900 shows Orville Darling (age 50) born May 1850 in Illinois to Delaware and Virginia-born parents is a Farmer owning his own farm and living in Aldine Twp., Norton Co., KS. Living with him is his wife of four years, Bell Darling (age 38) born September 1861 in Missouri to Indiana and Ohio-born parents with 7 of the 10 children born to her still living. Orville Darling's eight children by his first wife are unmarried and living at home, born to Illinois and Missouri-born parents: Ida Darling (age 22) born August 1877 in Nebraska; Clarence Darling (age 18) born May 1882 in Kansas, a Farm Laborer; Walter Darling (age 16) born September 1883 in Kansas; Harvey Darling (age 13) born November 1886 in Kansas; Earnest Darling (age 11) born April 1889 in Kansas; Laura Darling (age 9) born November 1890 in Kansas; Florence Darling (age 7) born December 1892 in Kansas; and Margaret Darling (age 5) born January 1900 in Kansas. Also living there are Orville Darling's unmarried step-children, all born in Kansas to Pennsylvania and Missouri-born parents: Albert Beldon (age 16) born October 1883; Earnest D. Beldon (age 13) born December 1886; Mabel Beldon (age 12) born August 1887; John W. Beldon (age 10) born March 1890; and Goldy L. Beldon (age 5) born March 1895. The 1905 Kansas State Census dated March 1, 1905 shows O. M. Darling (age 54) born in Kansas is a Farmer living in Aldine Twp., Norton Co., KS. Living with him are: Harvey Darling (age 19) born in Kansas; Ernest Darling (age 15) born in Kansas; Jim Belden (age 13) born in Missouri; Goldie Belden (age 11) born in Kansas; Belle Darling (age 42) born in Kansas; Francis D. Darling (age 7 months) born in Kansas; Laura Darling (age 13) born in Kansas; Florence Darling (age 11) born in Kansas; and Maggie D. Darling (age 5) born in Kansas. The 1905 Kansas State Census dated March 1, 1905 shows August Krause (age 49) born in Germany and lived there 1 year and having moved from Wisconsin after living there 3 years is a married Farmer owning his own farm and living in Aldine Twp., Norton Co., KS. Living with him are: Oscar Krause (age 16) born in Kansas 17 years ago; Alfred Krause (age 14) born in Wisconsin and lived there for 2 years; Wallace Krause (age 12) born in Kansas; Jason Krause (age 10) born in Kansas; Mary J. Krause (age 45) born in Canada and lived there 1 year and having moved from Wisconsin; Elda Krause (age 21) born in Kansas; Belle Krause (age 19) born in Kansas; Nellie Krause (age 9) born in Kansas; and Lucille Krause (age 6) born in Kansas. At the home of Mr. and Mrs. A. F. Krause Feb. 26, 1907, at three o'clock Mr. Walter Darling of Beaver City Neb. and Miss Elda E. Krause of Norton county were united in marriage; Belle Krause sister of the bride acted as her bridesmaid and Mr. McRoy best man. The young peoples' friends wish them a happy and prosperous life. After the ceremony the wedding party was led to the dining room where the inner man was satisfied by all. The Bride received many valuable presents among which was a check from her father. On January 15, 1909, W. E. Darling was in Buhl, ID, seeking land, according to a newspaper listing in the Twin Falls Weekly News. Walter Darling, from the Darling settlement north of town, is packing a Rock Island car today with household effects and with Ira Barker of the same neighborhood, will move to Gooding, Idaho. Barker is packing a car at Almena. Both will take their families and give Idaho a good trial. Neither has disposed o his Norton county farms, thus leaving an anchor to windward. Mr. Darling has leased of his father-in-law, Mr. Krause, a forty acre farm near Gooding, soon to be put under water. Mr.. Krause owns 320 acres of land there in a body. The 1910 U. S. Census taken on May 11, 1910 shows Walter E. Darling (age 26) born in Kansas to Illinois-born parents is a Ranch Farmer living in Gooding Precinct, Gooding Co., ID. Living with him is his wife of three years, Elda Darling (age 26) born in Kansas to German and Canadian-born parents, who has her only child still living. Also there is his daughter, Louis Darling (age 2) born in Kansas to Kansas-born parents. Personal Debate Over Ditch, Water, ect. Walter Darling and Oscar Bryant, two farmers living four miles north of ton, had a debate between themselves over water rights last Wednesday evening. Shovels and fists were the chief arguments used, and judge Fuller will be called upon today to act as referee in the colliloquy. Each of the debaters carries a black and blue spot as a result of the difficulty. An irrigated country does not seem to be the right sort of location for neighbors to live up to the scriptural injunction, "Behold how good and pleasant it is for brethren to dwell together in unity." Deputy sheriff Chapman says there are more personal scraps in and around Gooding than any other place in the country, which shows there is a good lively bunch here - Idaho Leader. 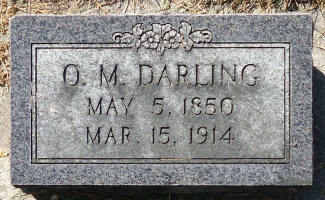 Orville Montlabon "Mount" Darling died March 15, 1914, in Gooding, Gooding Co., ID, at age 63. Buried in Elmwood Cemetery, Gooding, Gooding Co., ID. 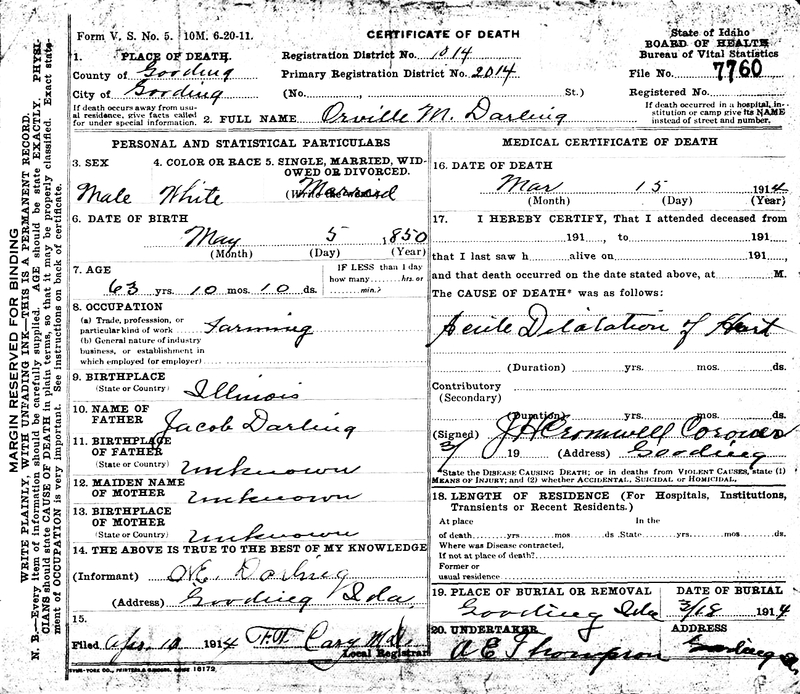 Orville Montlabon "Mount" Darling Death Record. O. M. Darling Drops Dead at Home of His Son. O. M. Darling, father of the Darling boys living north of Gooding dropped dead early Sunday at the home of his son Walter Darling. Deceased was 64 years of age, left his old home in Norton, Kan., last fall and came to Gooding. From here he went to the coast, where he spent the winter, and only a few days before his death he came to Gooding to make his home. He expected to buy land and establish his home, but the hand of death interferred with the man-made plans, and death came as a sudden summons. Burial was had in the new cemetery Wednesday, after services which were held in the Christian church by Cliff K. Titus. The deceased was a member of the Christian church in Kansas. The funeral was largely attended by the legion of old Norton people, and by the friends and neighbors of the relatives of the deceased about Gooding. Two sons, Walter and Ernest, and a daughter, Miss Florence Darling survive in Gooding. Orville M. Darling was born in Macon County, Illinois, in 1850, and is survived by his wife and five children. He united with the Christian church early in life, and has lived consistently in the faith in all the years since. A man of broad ideas, clear conceptions of duty, and unswerving integrity, he held the respect of his acquaintances everywhere he was known. His death is a distinct shock to not only the members of his family, but to his acquaintances as well. Orville Darling was born May 5th, 1850 at Vermont, Illinois and died on March 15th 1914 at Gooding Idaho of heart failure. He was married to Louisa Hoopson New Years day 1870. To this union was born ten children four of them with their mother have gone on before. His wife died Dec. 3, 1893 and is buried at Norton. He left Illinois in 1874 came to Clay County, Nebraska, and then to Miami county Kansas in 1876 and in 1879 he moved to Norton county Kansas and homesteaded 6 miles north of Norton on which has been his home until the last six months. October 1st, 1913 he had a sale and moved to Portland, Oregon, and not liking it there he came back to Gooding, Idaho where Walter, Ernest and Florence Darling live. He had only been there a day or so when he was stricken with that fatal disease that call so many home. In 1895 he was married at Smith Center Kansas to Mrs. Belle Beldin and to this union two children are living, Maggie and Francis. He was united with the Christian Church in 1870 and strong in that belief, was a kind and loving father, and a devoted husband, always had a cheerful word for those he met, and tried to look on the bright side of everything. His family ere with him at the time of his death and there are left to mourn for him in his companionship, Francis and Maggie, Walter, Ernest and Florence, his children that could not be there are Mrs. Will Frans, Emmer Darling, of Portland, Oregon, Clarence Darling, of Steele city, Nebr., and Laura Darling, of Norton. He had 5 brothers and one sister living, W. H. Darling, of Fort Scott, Kansas, Albert Darling, of Marshall, Mo., Mr. E. W. Howard, of Kansas City, Kansas, Joe Darling, Coyle, Oklahoma, George and Charlie Darling of Norton. As we think of him laid away so far from us these lines come to our minds: Asleep in Jesus far from thee, Thy kindred and thy grave may be, But yet it is a blessed sleep, From which none wake to weep. We wish to thank many friends for their sympathy and kind inquiries regarding our father and brother's daeth. 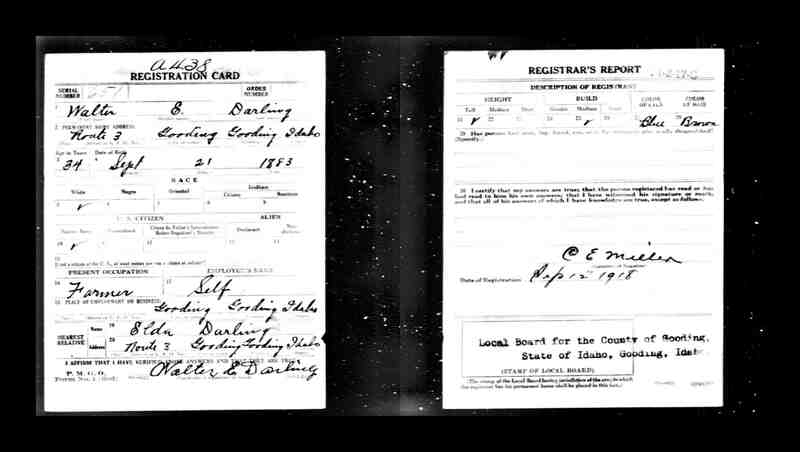 The WWI Draft Registration Report dated September 12, 1918, shows Walter E. Darling, age 34, born September 21, 1883, is a Farmer residing in Gooding, Gooding Co., ID. 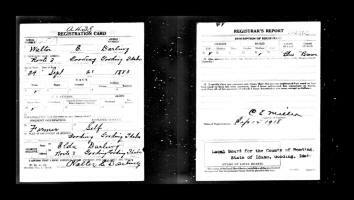 Walter Everett Darling's WWI Draft Registration Report. The 1920 U. S. Census taken on January 11, 1920, shows Walter E. Darling (age 36) born in Kansas to Illinois-born parents is a General Farm Farmer owning his own farm free of a mortgage and living on 7th Avenue, City of Gooding, West Gooding Precinct, Gooding Co., ID. Living with him is his wife Elda E. Darling (age 36) born in Kansas to German and Unknown-born parents. Also there are his children, all born to Kansas-born parents: Lois M. Darling (age 12) born in Kansas; Mary A. Darling (age 9) born in Kansas; Nile E. Darling (age 7) born in Idaho; Mabel Darling (age 4-2/12) born in Idaho; and Myrtle Darling (age 4-2/12) born in Idaho. Albert William Lulloff and Lois Mae Darling were married September 21, 1927, in Gooding, Gooding Co., ID. Albert William Lulloff and Lois Mae Darling Marriage Record. The 1930 U. S. Census taken on April 17, 1930, shows Walter E. Darling (age 46) born in Kansas to Illinois-born parents is a Farmer owning his own farm and living in East Gooding Precinct, Gooding Co., ID. Living with him is his wife Elda E. Darling (age 46) born in Kansas to German and Canadian-born parents, and both were age 23 when married. Also there are his children, all born to Kansas-born parents: Nile E. Darling (age 17) born in Idaho; Mable G. Darling (age 14) born in Idaho; and Myrtle J. Darling (age 14) born in Idaho. 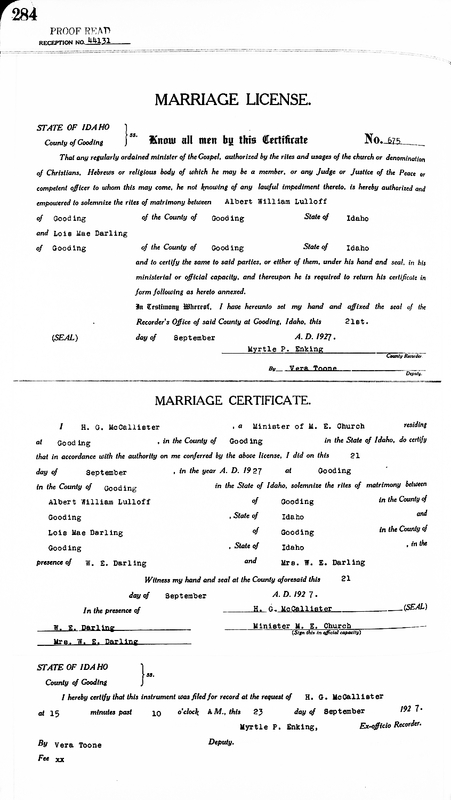 Nile Everett Darling and Thelma B. Harris were married July 22, 1933, in Gooding Precinct, Gooding Co., ID. 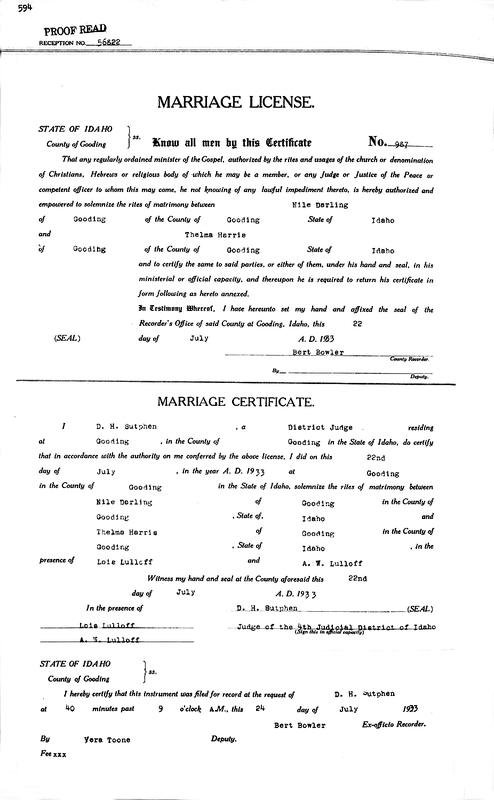 Nile Everett Darling and Thelma B. Harris Marriage Record. The 1940 U. S. Census taken on April 15, 1940, shows Walter Darling (age 56) born in Kansas, and 5 years ago was living in the Same House, and with 8 years of School, is a married Farmer of a Farm, and who owns his Farm worth $1,000 and is living in Northeast Gooding Precinct, Gooding Co., ID. Living with him is his wife, Elda Darling (age 56) born in Kansas, and 5 years ago was living in the Same House, and with 8 years of School. 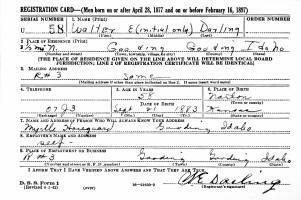 The WWI Draft Registration Report dated April 27, 1942, shows Walter E. Darling, age 58, born September 21, 1883, in Norton, KS, is a Farmer residing 3-1/2 miles north of Gooding, Gooding Co., ID. 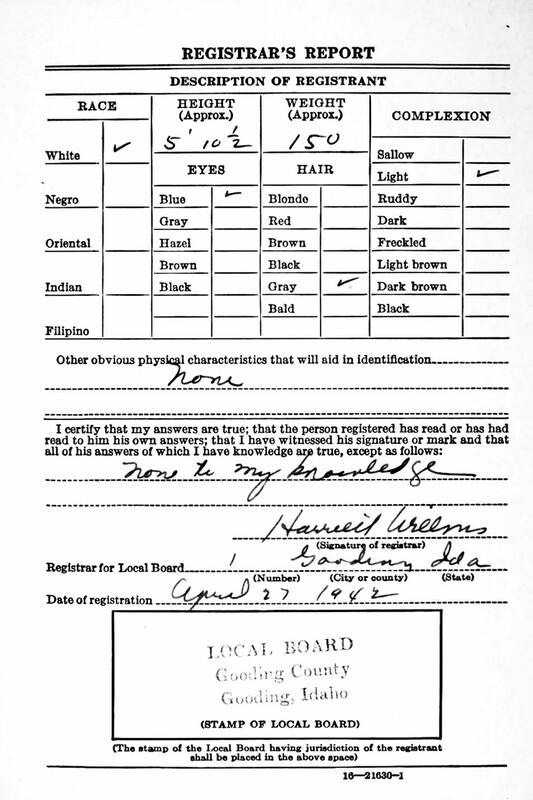 Walter Everett Darling's WWII Draft Registration Report. Nile Everett Darling enlisted November 13, 1942, in the USNR, and was Discharged November 6, 1945, at a Grade SF 2. He served in the 48th Construction Battalion on the U. S. S. Henderson in March 2, 1943. Mary Jane (Abbey) Krause died July 17, 1954, in the hospital of Fairview Rest Home, Degolia, Bradford Twp., McKean Co., PA, at age 94. Mrs. Mary Jane Krause, 96, mother of Alfred A. Krause of 26 Bon Air Ave., died at the Fairview Hospital, Degolia, Saturday afternoon at 1 o'clock. Born in Montreal, Canada, on July 3, 1858, Mrs. Krause lived in Kansas most of her life. She came to Bradford in October, 1943. On November 3, 1944, Mrs. Krause fractured her hip and had been a patient in the hospital since that time. She is survived by three sons, Oscar W. Krause, Bellflower, Calif., Alfred O. Krause, Bradford, and Wallace E. Krause, Green Island, Iowa; one daughter, Mrs. W. E. Darling, Gooding, Idaho; 16 grandchildren, 22 great-grandchildren and 26 great-great-grandchildren. A brief prayer service was held yesterday afternoon at the Koch-Chatley Memorial Chapel. Howard Smith, Reader of the First Church of Christ officiated. The body was taken last night to Norton, Kan., where further services and burial will take place Wednesday afternoon. Nile Everett Darling died due to suicide, February 11, 1959, at his home, 4451 Redding St., Oakland, Alameda Co., CA (age 46). Buried in Golden Gate National Cemetery, San Bruno, San Mateo Co., CA. U. S. Navy SF2. A 47-year-old plumber took his own life last night, after knocking his wife to the floor in the bedroom of their home and threatening her with a pistol. Nile E. Darling of 4451 Redding St., threatened to shoot his wife, Elizabeth, 61, and then turned the pistol on himself, firing a bullet into his chest. He was pronounced dead on arrival at Highland Hospital. The coroner's office termed the death a suicide. Mrs. Darling told officers her husband had been drinking and they argued as they prepared to retire. Suddenly he struck her, she said, then took the gun from a dresser drawer. After shooting himself, he placed the pistol on top of the dresser aand fell across the bed. She called a neighbor, Mrs. Velna Lopez, 43, of 3440 Storer Ave., who called police. DARLING, Nile E., In Oakland, February 11, 1959, beloved husband of Elizabeth Darling; loving son of Mr. and Mrs. Walter Darling of Gooding, Idaho; brother of Lois Lulloff and Mary Cleveland of Idaho, Myrtle Hoggaard and Mabel Mason of Montana. A native of Gooding, Idaho; aged 46 years. Friends are respectfully invited to attend funeral services Monday, February 16 at 12:45 noon at the Fruitvale Chapel of the Clarence M. Cooper Mortuaries, 1580 Fruitvale Avenue, Oakland. Interment, Golden Gate National Cemetery, San Bruno (Phone KE llog 3-4114). Parking area adjacent to chapel. Walter Everett Darling died May 17, 1964, at his home, Gooding, Gooding Co., ID, at age 80. Buried in Elmwood Cemetery, Gooding Co., ID. GOODING, May 18 - Walter E. Darling, 80, longtime Gooding resident, died Sunday at his home of a long illness. He was born Sept. 21, 1883, in Norton county, Kansas and married Elda E. Krause, Feb. 26, 1907. He farmed in Kansas until 1909 when he moved to a farm near Gooding. He retired in 1942 and moved into Gooding. He was a member of the IOOF Lodge and a charter member of the Gooding Grange. Surviving are four daughters, Mrs. A. W. (Lois) Lulloff, Twin Falls; Mrs. G. W. (Mary) Cleveland, Boise; Mrs. T. E. (Mable) Mason, Crow Agency, Mont., and Mrs. Garth (Myrtle) Hougaard, Billing; one brother, E. V. Darling, San Diego; three sisters, Francis Darling, Caldwell; Mrs. Margaret Allan, Beverton, Wash., and Mrs. Florence Smith, San Diego, and 13 grandchildren and 17-great-grandchildren. Funeral services will be held at 3 p.m. Wednesday at Thompson chapel by the Rev. Harold Hake, Christian church. Final rites will be at Elmwood cemetery. Friends may call at Thompson chapel Tuesday evening and until time of services Wednesday. GOODING - Funeral services for Walter E. Darling will be conducted at 3 p.m. Wednesday in the Thompson chapel by the Rev. Harold Hake, Christian church. Final rites will be at Elmwood cemetery. Elda Elora "Eldie" (Krause) Darling died March 28, 1969, at Magic Valley Memorial Hospital, Twin Falls, Twin Falls Co., ID, at age 85. Buried in Elmwood Cemetery, Gooding Co., ID. GOODING - Mrs. Elda E. Darling, 85, died Friday morning at the Magic Valley Memorial Hospital of a lingering illness. She had resided at the Hazel Del Manor for one year. She was born May 21, 1883 in Wisconsin. 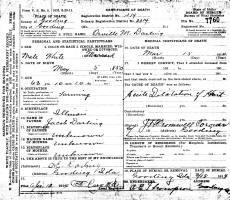 She moved to Norton, Kan. She married Walter Darling in Norton on Feb. 26, 1903. They moved to Gooding in 1909 and farmed there until 1939, when they retired and moved to Gooding. She was a member of the Gooding First Christian Church and the Northside Community Club, Gooding. She is survived by four daughters, Mrs. A. W. (Lois) Lulloff, Twin Falls; Mrs. G. W. (Mary) Cleveland, Boise; Mrs. T. E. (Mable) Mason, Crow Agency, Mont., and Mrs. G. C. (Myrtle) Hougaard, Billings, Mont. ; thirteen grandchildren and 20 great-grandchildren. She was preceded in death by her husband, six brothers and four sisters. Funeral services will be conducted at 2 p.m. Tuesday at the Gooding First Christian Church by Rev. Harold Hake. Friends may call at Leeper Mortuary, Wendell, Sunday noon until Tuesday noon and at the church from noon until 2 p.m. Tuesday. Final rites will be held in Elmwood Cemetery. Mary Agusta (Darling) Cleveland died May 2, 2001, at Hillcrest Care Center, Boise, Ada Co., ID, at age 90. Mary D. Cleveland, 90, of Boise, died Wednesday, May 2, 2001, at a Boise care center. Services will be held at 3 p.m. on Sunday, May 6, 2001, at Summers Funeral Homes, Boise Chapel. Reverend Ralph Lawrence of First United Methodist Church, Cathedral of the Rockies, will officiate. Arrangements are under the direction of Summers Funeral Homes, Boise Chapel. Mary was born on June 18, 1910, in Gooding, Idaho, to Walter E. and Elda E. Kraus Darling. She attended school in Gooding, graduating from Gooding High School. She then attended Gooding Normal School and graduated from the University of Idaho with a degree in education. Mary taught in a one-room school house on the Camas Prairie. On December 31, 1933, Mary married George W. Cleveland in Gooding, Idaho. They lived and worked in many communities in the state of Idaho. Mary enjoyed playing bridge, and achieved Life Master in duplicate bridge. She was also a 50-year volunteer for the American Red Cross. Her greatest achievement was making a house a home for her family and friends. Mary is survived by her daughters, Yvonne Archie Hess of Calgary, Canada, and Elizabeth Liz MacGregor of Boise, Idaho; her son, G. W. Cleveland, Jr. of Billings, Montana; six grandchildren; 12 great-grandchildren; and one sister, Myrtle Hougaard of Billings, Montana. She was preceded in death by her husband, George; a son; three sisters; one brother; and three grandchildren. The family suggests memorials be made to the Idaho Youth Ranch, P.O. Box 8538, Boise, Idaho 83707, or the Idaho Rose Society, c/o Edna Schultz, 5000 Spaulding, Boise, Idaho 83705. The family wishes to thank the caregivers, the nurses, and friends at Hillcrest Care Center for their TLC these past four years. Lurline (Quigley) Stafford died Wednesday, Nov. 10, 2004, in a Caldwell care facility, Caldwell, ID, at age 90. Lurline Stafford, 90, Parma, died Wednesday, Nov. 10, 2004, in a Caldwell care facility. A family service will be at a later date. Lurline will be buried in Lower Boise Cemetery, east of Parma. Cremation and burial is under the direction of Dakan Funeral Chapel, Caldwell. She was born April 5, 1914, in Twin Falls, the only child of John Quigley and Blanche Trueblood. Lurline attended schools in Alberta, Canada and Chippewa Falls, Wis., graduating in Twin Falls. She married John Stafford in Brooks, Alberta in 1932. They farmed in Nyssa on Alberta Ave. for several years and lived in Bremerton, Wash., for a while during World War II while John welded at the shipyard. Lurline had many good memories of the years that she lived in Wilder and was active in the Golden Gate Baptist Church and later in Ontario with friends and First Baptist fellowship. At the time of her death, she was a member of The First Christian Church in Caldwell. Lurline was an accomplished musician and a good bridge player. She loved get-togethers with friends and good times and big dinners with her family. Lurline is survived by her daughters, Jorene Matthews, Nampa and Dana (Lloyd) Collord, Parma; grandchildren, Jon (Tari) Stockton, Parma, Mike (Pam) Matthews, Boise, Susan McGarvin, Boise and Michelle Franks, Nampa; great-grandchildren, Ryan, James, Heather, Charlie and Anna; and a special cousin, Ferris (Mary Anne) Sweet, Twin Falls. Lurline was preceded in death by her husband, John in 1988; and her parents. Myrtle Jean (Darling) Hougaard died September 11, 2006, in Billings Clinic, Billings, Yellowstone Co., MT, at age 90. Buried in Mountainview Cemetery, Billings, Yellowstone Co., MT. 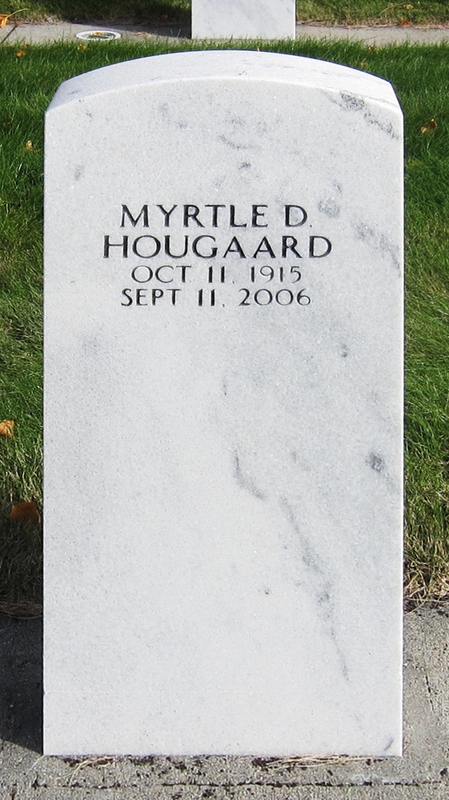 Myrtle Hougaard passed away Monday, Sept. 11, 2006, at Billings Clinic, just one month short of her 91st birthday. On Oct. 11, 1915, she was born with her twin sister, Mabel, in Gooding, Idaho, to Elda (Krause) and Walter Darling, joining a family of two sisters and one brother. In 1935, she married Garth Hougaard. When he joined the Navy, she and their daughter, Frankie, moved to California. After the service, they moved to Montana, where they went into the bee business and later operated a gas station with Mabel and Truman Mason. While in Crow Agency, she worked in the Post Office for many years. In the late '50s, Myrtle, Garth and daughter Nancy moved to Billings, where Myrtle enjoyed playing golf and cards with friends. Myrtle is survived by a daughter, Frankie Carey of Oakland, Calif., and her family, Misty Carey of Bozeman, Camille Carey of New York City, Mike Carey of Miles City and great-grandson, Colton of Bismarck, N.D.; a daughter, Nancy (Gary) Pederson of Billings and her family, Kristi (Ryan) Tieszen, great-grandsons, Matthew and Morgan of Laurel, and Holli (Mike) Sannon, and great-grandson Sterling of Billings. She is also survived by several nephews and nieces and their families. She was preceded in death by her husband, Garth, in 1990; parents; sisters, Mary Cleveland, Lois Lulloff, Mabel Mason; and brother, Nile Darling. A memorial service to celebrate her earthly life and her newfound life with Jesus will be held at Faith Chapel, Friday, Oct. 6, at 10 a.m. Inurnment will follow at Mountview Cemetery. Memorials may be made to the Employee Christmas Gift Fund, St. John's Lutheran Ministries or the charity of your choice. Cremation or Funeral Gallery has charge of arrangements. Myrtle D. Hougaard, 90, who had worked many years at the post office in Crow Agency, died Monday, Sept. 11, 2006, at Billings Clinic. On Oct. 11, 1915, she was born with her twin sister, Mabel, in Gooding, Idaho, to Elda (Krause) and Walter Darling. In 1935, she married Garth Hougaard. When he joined the Navy, she and their daughter, Frankie, moved to California. After the service, they moved to Montana, where they went into the bee business and later operated a gas station with Mabel and Truman Mason. While in Crow Agency, she worked in the Post Office for many years. In the late ’50s, the family moved to Billings. Survivors include daughters, Frankie Carey of Oakland, Calif., and Nancy Pederson of Billings; four grandchildren; and five great-grandchildren. Services will be at Faith Chapel at 10 a.m. Oct. 6. Inurnment will follow in Mountview Cemetery. Cremation or Funeral Gallery has charge of arrangements. Memorials may be made to the Employee Christmas Gift Fund or St. John’s Lutheran Ministries.